Meteorological winter has ended, as well as ours. Spring is into full swing this week. 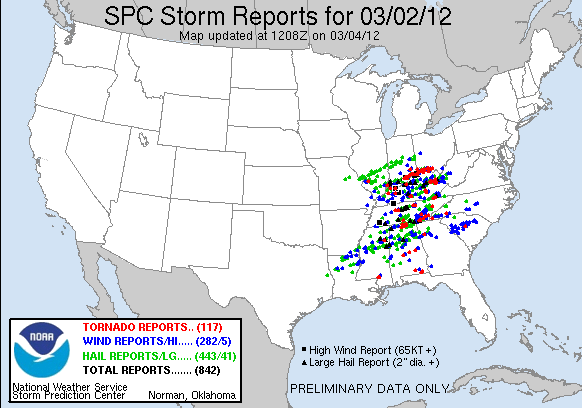 The first issue I want to comment on is the tornado outbreak on March 2nd. Over 30 deaths were reported from these superstorms. The amount of rotation recorded in these cells was astounding, and tornadoes were coming down left and right. 117 tornadoes were reported. More outbreaks are likely in March and April, as our pattern slowly shifts to a summer one. A clipper will pass to our south on Tuesday, giving Virginia a few more inches. Then high pressure will set up to our East and will warm temperatures up significantly on Thursday and Friday. 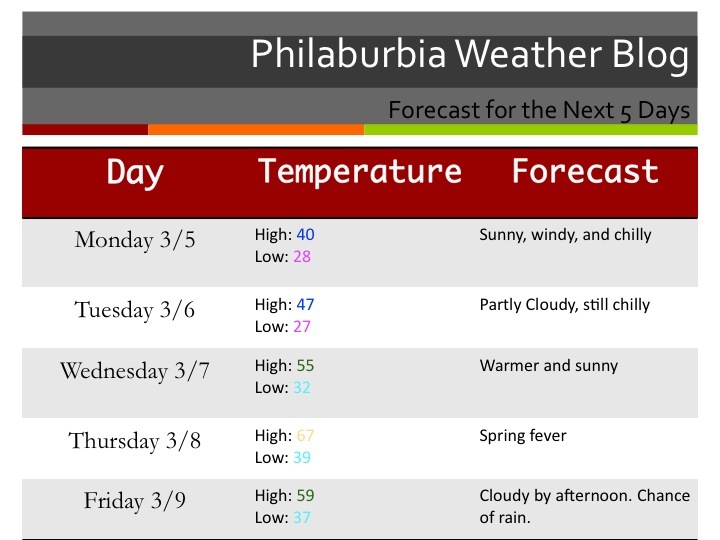 I would not rule out 70 degrees in some areas on Thursday. By next weekend, a cold front will cool us down, before another ridge moves in and sends temperatures back into the 60s. Weak El Niño years have fairly calm hurricane seasons. 2009 was a great example of a weak El Niño. Only 10 named storms formed that year. Other El Niño years include 1997 (7 named storms), 2002 (12 named storms), and 2006 (20 named storms). If a weak El Niño exists this summer, we will likely see around 10-12 named storms with 1-2 of them affecting the mainland USA. Neutral years, on the other hand, have extremely active hurricane seasons. If a neutral pattern exists during this hurricane season, the number of hurricanes will likely be similar to the 2001 and 2002 hurricane seasons. Those years, there were 15 and 12 named storms respectively. For each year, there was a weak La Niña transitioning to neutral, just like this year. Your source on the nino map, sir?